This is a faith-affirming book that is as worthwhile as it is unusual in telling the story of a devout Muslim who encounters Christianity. The author, a trained medical doctor with further training in religion, gives rare insights not only into the realities of growing up in a Muslim family, but also into the religion of Islam and Christianity itself. The author was a state champion debater and he brings his debating skills to this book – carefully developing and assembling his points in a watertight manner. But this does not mean that the book is a dry or pedantic collection of arguments. Qureshi takes us through the heart-wrenching difficulties of converting from a faith he had always considered the only truth to a new way which he reluctantly comes to see is the only way. In the process of showing how he made the transition, Qureshi gives us a penetrating look inside the Muslim faith – at both its strengths and weaknesses – and this book will open the eyes of most readers to a wholly different world view as well as to a different religious perspective. This is a must read for all those who want to understand their Muslim friends and neighbors better and to understand facts that cannot be overlooked in helping ourselves or others assess Islam. The book will also help most readers to better understand Christianity itself as a result of Qureshi’s patient research and analysis as he compares and contrasts the two faiths. There are a number of powerful lessons in the book, not the least of which is the vital importance of real, long-term friendship with Muslims if we are to reach them and help them as neighbors and as Christians. It is only in that long-term and close friendship that the right opportunity may arise to share our faith or to answer sincere questions. Qureshi does an excellent job of showing how distasteful “out of nowhere and in your face” evangelizing appears to Muslims and how the patient, concerned friendship of his Christian friends helped him gradually come to the point of conversion. The book is fascinating and helpful on many levels. It is a moving and extremely worthwhile read for any Christian and will be of great interest to two particular groups. 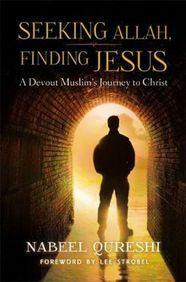 On the one hand, it is a must for anyone who may have the opportunity to serve and to help those of the Muslim faith (or Muslims themselves who wish to assess their own religion, of course), and on the other hand, Seeking Allah, Finding Jesus is a book that could sway anyone who thinks that there is no rational basis for the Christian faith.